This is the second of week of the readalong of ‘The Mysteries of Udolpho’ by Ann Radcliffe that I am doing with Delia from Postcards from Asia. You can find the first post of this series here. This week we are covering the second volume of the book. Here is what I think of the second volume. We left Emily, parting with her lover Valancourt at the end of the first volume. In the second volume, Emily and her aunt and her aunt’s new husband Signor Montoni leave France for Italy. The journey through the Alps is quite beautiful. They reach Turin and then Venice. They move into Montoni’s beautiful apartment which opens out to the waterfront. Emily spends every evening with her aunt and other friends going out in gondolas, listening to beautiful music by accompanying musicians and being courted by a gentleman called Count Morano. But Emily hasn’t forgotten Valancourt and so she rejects Count Morano. Unfortunately, the count is persistent. Montoni and Morano come to an agreement and Emily is told that she has to marry the Count and if she refuses she has to face the consequences. A date for her marriage is fixed. While Emily dreads the arrival of that hour, suddenly Montoni asks everyone at home to pack up and leave. 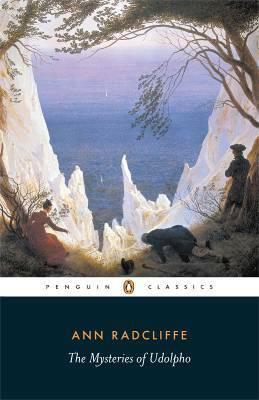 They go on a long journey through mountains and reach the castle of Udolpho. Emily feels that she has escaped from being married to the Count, but then she has to face the terrors of the castle. The castle has many rooms which are locked and there are stories of a ghost of the previous owner of the castle passing through different rooms and there is also a rumour of a veiled portrait in one of the rooms. Emily once stumbles upon the veiled portrait, but her aunt’s maid, Annette, who is with her, refuses to help her unveil it. When Emily has a chance during the day, when it is bright, to go to that room again, she lifts the veil, but what sees beneath it terrorizes her and she faints. She realizes that it is no portrait but something which is extremely terrifying. What this terrifying this is, we the readers don’t know. Morano comes to the castle and continues pursuing Emily, but Montoni has a fight with him and sends him away. Relations between Montoni and Emily’s aunt break down, as it emerges that Montoni wants his wife to give away all her estates to him. Montoni imprisons his wife in a remote part of the castle. There are strange people in the castle who look like bandits and who listen to Montoni’s orders. Emily spends every day in dread and fear. The second volume ends here. The second part of the second volume changes drastically in character. The atmosphere gets drastically transformed from gay, fun-filled Venice to the dark, terrifying castle of Udolpho. I liked very much the poems which continue to come in the second volume of the book. My favourite poem in the second part of the book is ‘The Sea-Nymph’ (you need to scroll to the end of the page at this link to read the poem). However, the poems which continue to flow in fun-filled Venice, suddenly stop when we reach Udolpho. I liked the way Signor Montoni is described in the second volume. He seems to be a man whose thinking is clear and logical. He doesn’t flip-flop as some of the villains do. I liked this description of him in the early part of the second volume. He had, of course, many and bitter enemies; but the rancour of their hatred proved the degree of his power; and, as power was his chief aim, he gloried more in such hatred, than it was possible he could in being esteemed. A feeling so tempered as that of esteem, he despised, and would have despised himself also had he thought himself capable of being flattered by it. It made me think of people who take criticism more seriously than praise. They like praise, but they value criticism more, even though they might not like it. Montoni seemed to be such a man. I continued to keep an eye for interesting spellings while reading the second volume. Here are some I discovered – ‘antient’ (for ‘ancient’), ‘intestine war’ (for ‘internecine war’), ‘lagune’ (for ‘lagoon’) and ‘shew’ (for ‘show’). Daylight dispelled from Emily’s mind the glooms of superstition; but not those of apprehension. Her present life appeared like the dream of a distempered imagination, or like one of those frightful fictions, in which the wild genius of the poets sometimes delighted. Reflection brought only regret, and anticipation terror. Thus it is always, when we attempt to describe the finer movements of the heart, for they are too fine to be discerned, they can only be experienced, and are therefore passed over by the indifferent observer, while the interested one feels, that all description is imperfect and unnecessary, except as it may prove the sincerity of the writer, and sooth his own sufferings. There were three mysteries which were still unresolved at the end of the second volume – the content of the mysterious packet of papers which Emily burnt, the identity of the woman whose portrait Emily has and the portrait (or whatever it was) that was there behind the veil. There was also the identity of the person who writes poems addressed to Emily in the first volume. I can’t wait to find out the secrets behind all these mysteries. (1) Did you find the transition of the story from the gay atmosphere of Venice to the dark, somber atmosphere of Udolpho very sudden or was it convincing? (2) Does the sense of horror and terror in the second volume come more because of the atmosphere rather than because of the events in the story? (3) What do you think about the descriptions of Venice in this story, when compared to other descriptions of this city? (4) Is the absence of poems in the second part of the volume by accident or by design? Do you think poems heighten the atmosphere of horror in a story? I can’t wait to read the third volume of the book and find out whether some of the mysteries are revealed in it. You can find Delia’s thoughts on the second volume of ‘The Mysteries of Udolpho’ here. I have been away from blogging for a while. I got into a book reading slump and it took me a while to get out of it. I managed to read a few books though – a children’s book by Susie Morgenstern, a few comics, a collection of tales of Edgar Allan Poe, a John Steinbeck novella, a collection of fairytales, a Lewis Carroll book. I also watched lots of movies. (I think these two deserve their own posts. So I will come back with a couple of them later this week.) I am happy now to get back to what I love doing the most – writing about my favourite books and commenting on my favourite bloggers’ posts. Now about Ann Radcliffe’s book. I discovered ‘The Mysteries of Udolpho’ through the movie ‘The Jane Austen Book Club’. There is a mention in the movie that Jane Austen’s ‘Northanger Abbey’ was inspired by ‘The Mysteries of Udolpho’, or rather Austen took a dig at gothic romances like ‘The Mysteries of Udolpho’ in her book. There is a conversation in the movie where one of the characters says that he went and read ‘The Mysteries of Udolpho’ after reading ‘Northanger Abbey’ because of this connection and another character exclaiming that she didn’t know that it was a real book. So, I got Ann Radcliffe’s book after watching this movie. But because it was a chunkster – my edition has 632 pages of small print, which will probably translate into 900 pages of normal size fonts, and the poems in the book are in really tiny font – I was waiting for the right time to read it. When Delia from Postcards from Asia suggested that we do a readalong of ‘The Mysteries of Udolpho’, I happily jumped at the opportunity. The book is divided into four volumes and we will be reviewing one volume each week and asking questions on each volume and discussing on it. Here is what I think about the first volume. The first volume of the book lays the basic groundwork for the story. It describes the life of the St Aubert family. Monsieur and Madame St Aubert live in a beautiful chateau in Gascony in the banks of the Garonne river, surrounded by beautiful mountains, trees, forests and valleys – the kind of place all of us dream of living in. They have a beautiful, grown up daughter called Emily. The St Aubert’s spend a lot of time together taking walks in the mountains, spending time reading, listening to music, having intelligent conversations and enjoying the sights, sounds and music of nature. Once during one of their walks, Emily discovers that she has a mysterious admirer because there is a poem written in a fishing-house they frequent, which is addressed to her, and which grows with the addition of new lines everytime they visit this place. Other than this unknown admirer, things are peaceful and tranquil for the St Aubert family. Then one day tragedy strikes. Madame St Aubert becomes ill and doesn’t recover from her illness and dies. It is a huge blow to the family and it deeply affects Monsieur St Aubert. The father and the daughter decide to take some time off and travel to nearby places as they feel that a change of scene would be good for their health. During their travels they meet a young man called Valancourt, who helps them during a few occasions. Monsieur St Aubert likes the young man and Emily and Valancourt discover that they have a lot in common and have long conversations and strike a friendship. Valancour however departs after a while leaving the father and the daughter to continue with their travels. During the journey, Monsieur St Aubert’s health deteriorates. They stop at a place where a peasant family takes care of them. But, unfortunately, it is to no avail. Monsieur St Aubert dies, leaving Emily in the care of his sister. But not before he extracts a promise out of her. The father tells the daughter that there is a set of papers which is hidden under a floor board in their chateau. He asks Emily to take them out and burn them. He also expressly forbids her from reading them. Emily promises her father that she will do the same. Later, Emily returns to her home, very depressed after having lost both her parents in a short period of time. After sometime she finds the papers and accidentally reads a few lines from them. She is shocked at what she reads. But we, the readers, don’t know what she has read. Then she burns the papers as she had promised her father, but she is not able to take her mind off what she has read. Meanwhile, Valancourt comes back and he professes his love for Emily. Emily loves him too, but in the absence of parents or elders at home, she feels that she can’t entertain him at home. At this stage, Emily’s aunt Madame Cheron walks in, tells Emily that as she is Emily’s guardian now, Emily has to move to her home. After this point the plot starts moving faster. Valancourt asks for Madame Cheron’s permission to meet Emily and Madame Cheron refuses because she thinks that Valancourt’s family’s status is questionable. But when she discovers that Valancourt is from a good family she allows him to meet Emily and even agrees to their marriage. Then a mysterious Italian called Signor Montoni appears on the scene, courts Madame Cheron, marries her and tries to take over Emily’s life. Volume 1 ends with Montoni forcibly breaking off Emily’s engagement with Valancourt, the lovers parting tearfully, and Emily and Madame Cheron leaving for Italy with Montoni. The deepest shade of twilight did not send him from his favourite plane-tree. He loved the soothing hour, when the last tints of light die away; when the stars, one by one, tremble through aether, and are reflected on the dark mirror of the waters; that hour, which, of all others, inspires the mind with pensive tenderness, and often elevates it to sublime contemplation. When the moon shed her soft rays among the foliage, he still lingered, and his pastoral supper of cream and fruits was often spread beneath it. Then, on the stillness of night, came the song of the nightingale, breathing sweetness, an awakening melancholy. There are pages and pages of descriptions like this, which are a pleasure to read. It was of uncommon beauty, and was characterized by an expression of sweetness, shaded with sorrow, and tempered by resignation. The subtitle of the book reads ‘A Romance : Interspersed with some pieces of poetry’. At the beginning of every chapter there is a poem or a snippet from a poem (typically written by another writer), while at many places in the book there are poems written by Radcliffe herself. I found this quite interesting, because I haven’t read a book which was interspersed by poems before. It changes the pace of the book and makes it an interesting reading experience, as in many places poems are used instead of prose to describe a scene or the feelings of a character and so it is not something that the reader can skip over. On page 12 of the book I encountered the word ‘tremour’. I know that many words have different spellings in British and American English (for example ‘colour’ and ‘color’), but ‘tremor’ is the same in both. So, I was surprised at this spelling. The dictionary tells me that it is the archaic version of ‘tremor’. After encountering this word, I thought I will keep an eye for further interesting deviations like this. Some of the interesting ones I discovered were ‘vallies’ (instead of ‘valleys’) and ‘expence’ (instead of ‘expense’). I also found some interesting stereotypes in the book which were probably the way people thought about things in late 18th century England or probably the way authors tended to represent things in their books during that era. Pastoral life is regarded as more pure and beautiful and innocent and the preferred way of living when compared to city life, natural forests are regarded as more beautiful than manmade parks and gardens, the main characters who are likeable are French who live in a natural environment, the not-so-good characters are French who live in the cities and the really bad ones (not confirmed yet, but whom I suspect so) are Italians. I have always thought that I have read a few gothic romances. But while starting this book, I thought about it and I discovered that I can’t remember any that I have read. The standard elements of a gothic romance – a castle with mysterious rooms and with strange things happening, a beautiful heroine screaming with terror, a vile Count as the villain, a handsome chivalrous hero coming to the heroine’s rescue – were all part of my story-reading mind, but I couldn’t think of a single novel in which these elements were all there. There are historical romances by Walter Scott which I have read and loved but they are not gothic romances. The closest to a gothic romance that I have read is ‘The Woman in White’ by Wilkie Collins, but if I remember right, there is no castle in the story (but there is an evil Count). It is interesting how we feel that we have read books from a genre, but when we sit back and think, we haven’t read any. I am looking forward to reading volume 2 now and finding out what happens to Emily in Italy, what the evil designs of Montoni are and what Valancourt’s plans are to win Emily’s hand. You can find Delia’s post on volume 1 of the book here.